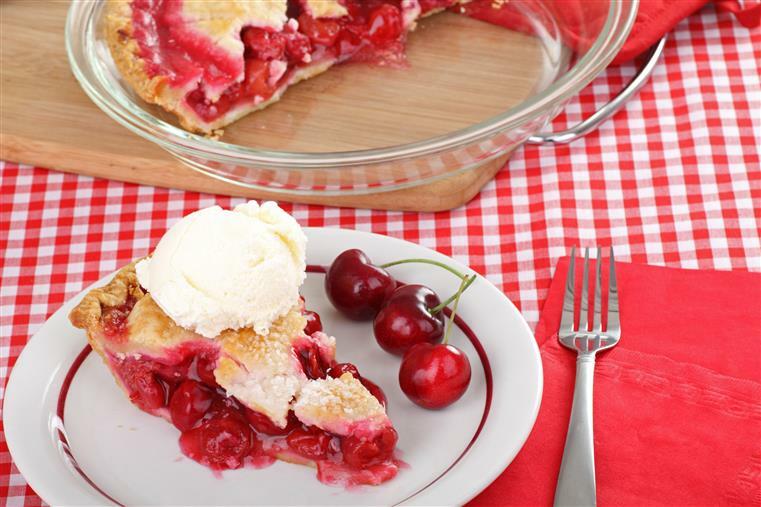 Noon Mark Diner served the first slice of delicious homemade pie in October of 1981. Taking over and renaming what had been a mildly successful diner, Noon Mark Diner has built a reputation for being more than just a roadside "hamburger stand." Featuring "homemade food" and really meaning it, the Diner specializes in homemade bread and, of course, the now-famous homemade pies. In the mid-eighties the Diner moved to its present location and, through renovations and additions, has continued year after year to improve customer service and comfort. "Many years ago, on a farm just north of here, it was probably a warm evening in midsummer when the family sat on their large "south" porch relaxing after a hard day's work. The setting sun cast an intricate patch-work of light and dark shades of green across the panorama of mountains south of Keene Valley. Most prominent in the panorama was the peak known as Noonmark Mountain. After some discussion that evening, it was decided the farm should be called "Noonmark Farm" after that most prominent peak to the south. For several decades Noonmark Farm fulfilled much of the Keene Valley area's need for dairy products until it ceased operation in the mid-forties. Noonmark Farm no longer exists; the barns are gone and most of the pastures are now overgrown; however, its farmhouse still stands in stark remembrance. 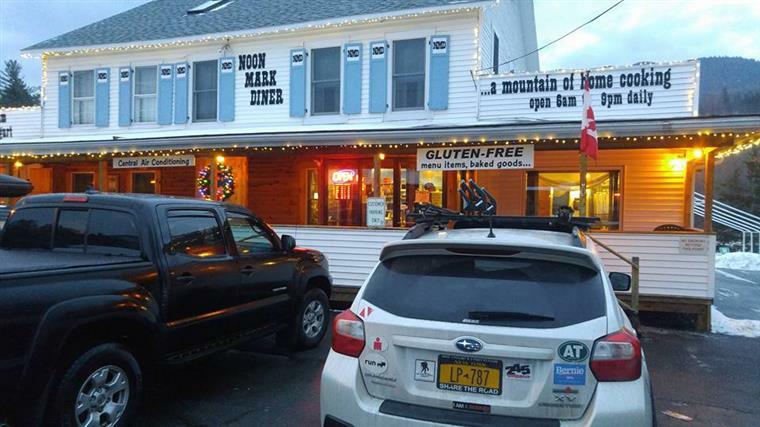 As a direct descendant of that family from many years ago, the family owning this eating place has adopted the name "Noon Mark" as a tribute to the hardworking people who established Noonmark Farm. Some of those hardy folks being Harvey Washbond, Shaw and Nellie Washbond, and Emerson Washbond. In their memory, Noon Mark Diner strives to be a warm and friendly eatery serving quality homemade food." 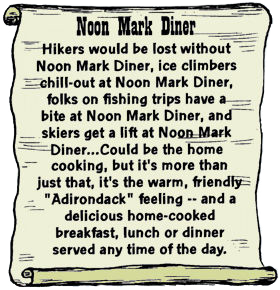 Noon Mark Diner is not only about food, but is also the Adirondack Trailways bus terminal for the area. So if you can't get to Noon Mark Diner by car, don't fear, you can always take the bus…nestled in amongst the Adirondack High Peaks, the awesome beauty of the area alone makes the trip worthwhile. Since this website reaches all over the world, folks from far away lands merely have to take a plane to Albany, New York, then the Adirondack Trailways bus to Keene Valley and there you are at Noon Mark Diner…it couldn't be more convenient. We are a smoke free environment.